How far are you willing to take radial access? The challenge for health care is to provide efficient, low-cost, high-quality care while also providing a great patient experience. A comprehensive radial program has the potential to meet that challenge head on! The constant incremental improvement in technology has allowed radial access to be utilized in patients undergoing both cardiac catheterization and percutaneous coronary intervention (PCI). When the radial approach is mastered, a host of opportunities and process changes will be available for your cardiac program. A comprehensive radial program will take years to build. It is a process that MedStar Union Memorial Hospital (MUMH) began in July 2010 with one operator. Today, 100% of the operators, both private and employed, have mastered the technique. After all of our operators became proficient at using the radial artery for access, we saw a noticeable improvement in your quality metrics. MUMH has seen improvements in their American College of Cardiology National Cardiovascular Data Registry data, noting that 40% of the metrics, published in the executive summary this June, were better than the 90th percentile. Figure 1. Example of a radial lounge for patients. Courtesy of MedStar Union Memorial Hospital. If you are able to drive a significant volume of radial access cases, there is the opportunity to gain efficiencies in patient throughput. No longer is a patient required to remain in bed for several hours postprocedure. We have been able to achieve individual room turnover in as little as 3 hours for cardiac catheterization and 6 hours for PCI. Furthermore, a robust program utilizing a radial lounge for the patients (Figure 1), along with administrative support, has allowed us to exponentially improve efficiency. We currently require patients to remain in their reclining chair for 1 hour and then allow them access to the lounge to watch television, read, or get something to eat, all while still being monitored. Patients undergoing routine PCI with radial access are now discharged the same day. The lounge allows us to provide patients with a completely new experience that is calmer and in a pleasant, less stressful environment. A robust radial program has the potential to decrease your overall costs. For example, it allows the possibility of changing your staffing model. Team members are able to monitor more patients in a lounge environment rather than in a bay or room. The greater the patient throughput, the less staffing is required overnight. The shorter length of stay also allows you to increase procedure volume without the need for additional resources. However, not every patient who has radial access is appropriate for the lounge and not every institution or program can support one. Nonetheless, every patient who qualifies for a radial approach can still benefit. So, how far are you willing or able to take radial access? MUMH chose to take it all the way from radial access to a radial program. 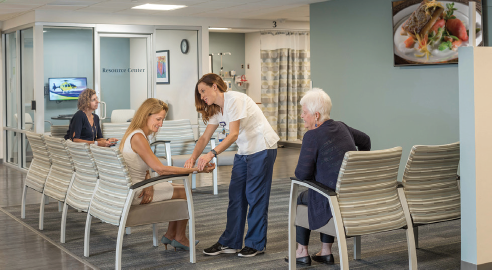 We discovered a different care model that is more efficient, lower in cost, and higher in quality, all while providing a more patient-friendly environment.